HERRAMIENTAS BICICLETA Hay 1 producto. EXTRACTOR DE CROMO VANADIO PARA EXTRAER CASSETTE Y NUCLEOS DE BICICLETA. 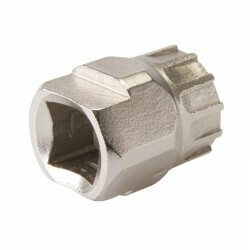 PARA UTILIZAR CON LLAVES DE TUBO DE 1/2" O VASOS DE 25MM Y LLAVES DE CADENA. COMPATIBLE CON CASSETTE DE ROSCA SHLIMANO HG SRAM, NUCLEOS CRYS KING Y SUNRACE SONTOUR. ACABADO GALVANIZADO RESISTENTE A LA CORROSION, CROMADO SATINADO GALVANIZADO.